(Artichoke - 01) Select compact artichokes that are heavy for their size. These larger ones are available only in the spring of the year. 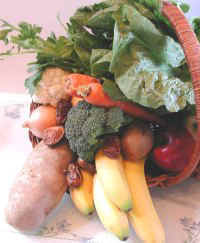 Smaller artichokes are available year round. If using smaller artichokes, we suggest increasing the number prepared, or halving the recipe quantities for the dipping sauce. Thoroughly wash the artichokes. 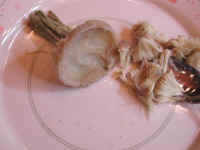 (Artichoke - 02) Some people recommend pulling off some of the shriveled bracts (leaves) from the body of the artichoke. We recommend leaving them on until after the artichokes are cooked, as they help protect the other bracts. We cut off only the stem bracts. We also recommend cutting off only the tip of the stem, as the inner flesh of the stem is quite tasty. (Artichoke - 03) Artichokes can be steamed or boiled. In order to maximize the nutritional value, we prefer steaming in a microwave oven. 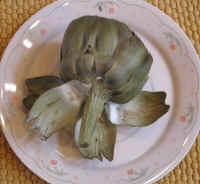 Place the artichokes in a large covered glass or ceramic baking dish for cooking in a microwave oven. 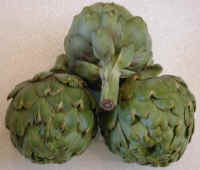 The water clinging to the freshly washed artichokes should be sufficient for steaming. (Artichoke - 04) These artichokes have been cooked for about 15 minutes. Note that a few of the bracts (leaves) have begun to dry out. This indicates that the artichokes are slightly over-cooked. 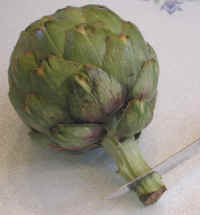 Another way to check that the artichokes are sufficiently cooked is to squeeze the stems, which should be softened. (Artichoke - 05) While the artichokes are cooking, prepare the lemon dipping sauce. We prefer to mix the ingredients in a blender at high speed. This disperses the oregano flavor throughout the sauce. Add all of the sauce ingredients to the blender container. Cover and run it at high speed until the oregano is evenly dispersed. Pour the contents into a microwaveable glass or ceramic container. When the artichokes are cooked, remove them from the oven and cook the sauce until it boils, mixing it frequently to prevent the corn starch from settling out and gelling at the bottom. The sauce can also be prepared on the stovetop in a pot with constant stirring. 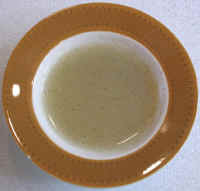 Pour the dipping sauce into individual serving bowls. Any leftover sauce may be used as a salad dressing. If preferred, use your favorite vinaigrette salad dressing as a dipping sauce. (Artichoke - 06) Place an artichoke on your plate and peel off one bract (leaf) at a time. The soft inner flesh and base of the bracts are the edible portion. Scroll down for next step. (Artichoke - 07) Dip each artichoke bract (leaf) in the dipping sauce and drag the underside of the bract across your lower teeth to scrape off the soft portion. Discard the remainder of the bract. It helps to learn from someone who has eaten an artichoke this way before. (Artichoke - 08) When all the bracts (leaves) have been removed, you are left with the artichoke heart with its hairy center. 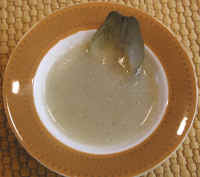 We use a serrated grapefruit spoon to remove the hairy center, but a table knife can also be used. 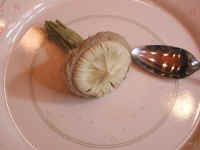 (Artichoke - 09) Hold the stem in one hand just below the heart and with the spoon or table knife in the other hand, gently scoop out the hairy center, as shown in this photo. Discard the hairy material. (Artichoke - 10) Dip the artichoke heart in the dipping sauce and enjoy. It's the prize! If the outside of the stem is "stringy," you can squeeze or scrape out the tasty center. 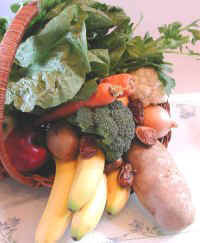 Some stems are very tender and can be eaten in their entirety. Enjoy!